Exciting new entertainment, dining and shopping experiences crisscross Walt Disney World Resort throughout the summer, offering something for everyone. Whether guests are seeking cool thrills on attractions such as Seven Dwarfs Mine Train at Magic Kingdom, Soarin’ at Epcot or Expedition Everest at Disney’s Animal Kingdom, visiting their favorite “Frozen” pals at Disney’s Hollywood Studios, shopping at Downtown Disney or splashing around at Disney’s Water Parks – there are endless ways to have a ‘cool’ time. The Coolest Summer Ever ramps up starting May 15 when cool stars from another galaxy invade Disney’s Hollywood Studios during Star Wars Weekends. Guests can experience special shows, presentations and dining options, encounter Star Wars celebrities and characters for photo ops and autograph signings or feel the power of the Force on Star Tours – The Adventures Continue. The event runs each Friday to Sunday, May 15 – June 14, and is included with Disney’s Hollywood Studios park admission. Thrill seekers anytime can experience attractions such as The Twilight Zone Tower of Terror, Rock ‘n’ Roller Coaster and family favorites such as Toy Story Midway Mania!. 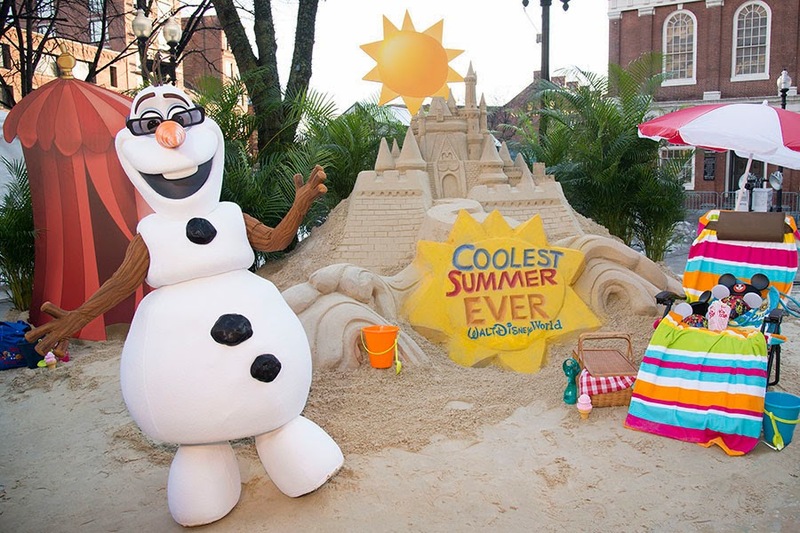 With Olaf as official host, the Coolest Summer Ever features a special event when Magic Kingdom Park will be open for 24 hours of nonstop fun May 22-23, Memorial Day Weekend, to launch the traditional start of summer vacation season. The fun heats up when “Frozen” Summer Fun LIVE starts June 17 and continues daily through Sept. 7 at Disney’s Hollywood Studios. Guest favorites Anna, Elsa, Kristoff and Olaf are welcomed to Hollywoodland twice each day as they take part in the Frozen Royal Welcome, a festive cavalcade throughout Disney’s Hollywood Studios, accompanied by the Royal Arendelle Flag Corps and a flurry of skaters, skiers and ice cutters. Just in time for “Frozen” Summer Fun LIVE, the popular show, For the First Time in Forever: A “Frozen” Sing-Along Celebration, moves into the beautiful Hyperion Theater (formerly Superstar Television Theater), located right in the heart of Disney’s Hollywood Studios. The Royal Historians of Arendelle host this fun and comedic retelling of the unique story of their kingdom, filled with delightful, sing-along moments from “Frozen,” plus all-new in-theater effects and special appearances by Anna, Elsa and Kristoff. But that’s not all that’s in store for guests visiting “Frozen” Summer Fun LIVE. The fun centers around the Event Stage throughout the day, with Olaf’s Summer Cool Down — where Olaf keeps things cool several times each day by sharing a burst from his personal snow cloud. Then once the sun goes down, DJ Chill and some favorite Disney Characters take to the stage to host the “Coolest Summer Ever” Dance Party. As the night comes to a close, Anna, Elsa, Kristoff and Olaf come together at the Event Stage for a grand finale to the day’s festivities, kicking off an awe-inspiring “Frozen” Fireworks display set to the music of “Frozen” and, of course, a flurry of snow! Downtown Disney – Guests can find hot summer fashion trends and cool new waterfront dining at Downtown Disney. With new retail stores such as Sanuk, APEX by Sunglass Hut, Havaianas, Erin McKenna Bakery NYC and more, as well as new dining experiences such as The BOATHOUSE (now open) and Morimoto Asia (opening fall 2015). Downtown Disney is currently undergoing the largest expansion in its history, to be renamed and re-imagined as Disney Springs, an exciting new waterfront district for shopping, dining and entertainment. Disney Springs will be fully completed in 2016. Disney’s Water Parks — Sunny ‘ski’ slopes and palm tree-lined lazy rivers await guests at Disney’s Water Parks – Blizzard Beach and Typhoon Lagoon – this summer. Fans of the upcoming Disney Channel Original Movie “Teen Beach 2” can beat the heat and enjoy the “Teen Beach 2: Beach Party” at Disney’s Typhoon Lagoon, featuring a DJ spinning retro tunes, beach-y themed games, hula hoop contests and more May 22 through July 5. And a cool new deal doubles the fun at Typhoon Lagoon and Blizzard Beach. When guests purchase a one-day water park ticket, they can park-hop between the two water parks in the same day that both are open. Magic Kingdom — When they’re not visiting Hollywoodland, Anna & Elsa from “Frozen” meet and greet with guests daily at Princess Fairytale Hall in Magic Kingdom. The royal sisters also appear during the daily Disney Festival of Fantasy Parade, and guests can enjoy visuals from “Frozen” during the “Celebrate the Magic” projection show that transforms Cinderella Castle each evening. Disney’s Animal Kingdom — New dining and entertainment offerings welcome Disney’s Animal Kingdom guests this summer as the theme park continues to undergo the largest expansion in its history. Africa Marketplace, a new shopping and dining option for park-goers in Harambe, the village anchoring the Africa section of the park, is planned to open spring 2015. One highlight of the new space will be Harambe Market, a new quick-service food and beverage location offering street-inspired dishes from walk-up windows. The new space also will open up a new pathway from Africa to Bradley Falls and the Asia section of the park. Canada – The Canadian Lumberjacks demonstrate the time-honored tradition of Canada’s great timber and logging eras in a thrilling and friendly competition, featuring axe throwing, chopping, log rolling and more. Italy – The spectacularly choreographed flag-throwing team of Sbandieratori Di Sansepolcro combines live music, energy, the flair of hand-painted flags, and magnificent period costumes. The Sbandieratori bring to dynamic life a rich, 500-year Italian tradition that’s not to be missed. Morocco – B’net Al Houwariyate, a multi-generational Berber music and dance troupe from Marrakesh, illuminates the stories and experiences of women in Morocco in a lively and interactive performance. United Kingdom – Strolling the quaint streets of the United Kingdom pavilion, the Paul McKenna Bandis a traditional, acoustic four-piece group from Glasgow, Scotland. Their contemporary approach to songs never strays too far from their Scottish, folk music roots. Guests can save up to 30 percent on stays at select Walt Disney World Resort hotels this summer. For example, guests can book a 5-night stay at select Disney Moderate Resort hotels and it’s like getting the fifth night for free. Guests can book now through June 12 by visiting Disneyworld.com/special-offers or by calling 407-W-DISNEY (931-7639) for travel dates June 16 through Aug. 27, 2015.